At the Northwest Alliance for Computational Science and Engineering, we specialize in making research databases available through web-based interfaces. Many of these databases contain biological data and usually include a spatial component. In addition to providing text-based query tools and results, we also create web-based mapping interfaces that integrate database contents, allowing the user to (1) visualize the data in context of their geographic location, and (2) query the map to return values from the associated database. We develop primarily in Perl and PHP and use a number of open source GIS tools, many of which are mentioned below. In addition to developing web-based interfaces, we also perform data cleaning, processing, manipulation, and analysis, mainly with ArcGIS but also using AMLs and/or GDAL and PROJ.4 to automate processing. MapServer Interfaces - Our MapServer interfaces run on a Linux server and are created completely with Open Source Software, including MapServer, PHP Mapscript, PHP, GDAL, PROJ.4, and a host of useful libraries. The Infectious Hematopoietic Necrosis Virus (IHNV) Database interface was developed in collaboration with the National Biological Information Infrastructure and the USGS Western Fisheries Research Center. Users can query specific virus-related disease data from salmonid fish in Alaska, British Columbia, Washington, Oregon, Idaho, and California. Results are displayed in tabular form and on an interactive map, both of which are highly customizable. A special feature allows users to compare viral genetic sequences from samples collected in disparate locations. The interface is database-driven, using PostgreSQL and PostGIS on the backend. Maps are generated using MapServer, and many of the base layers are rendered from TIGER/Line data. 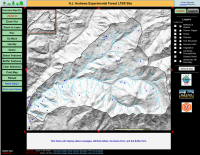 Over 15 GB of digitized, georeferenced 7.5" topographic maps (DRGs) encompassing Oregon can be browsed, queried for metadata, and downloaded. This interface allows users to browse and query GIS map layers from several of the Long Term Ecological Research sites. Users can quickly switch among the various sites by selecting from the drop down menu in the title bar. Some sites are not yet included due to a lack of spatial data for their respective regions. Personnel from the LTER Network Office needed a way to dynamically generate flight line reference maps from AVIRIS imagery header file information. This interface supports both UTM and Geographic projections, and allows the user to quickly generate reference maps for several LTER sites. This interface was developed years ago in ArcIMS 3.0. The H.J. Andrews LTER site is located east of Eugene, Oregon in the Cascades mountain range. 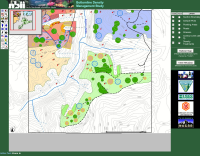 A great deal of forest research is conducted at this site, and both researchers and managers wanted a Web-based interface that would allow them to browse map layers and retrieve information from the site. This is a mirror of the production site, which is located on an OSU College of Forestry server. The Bottomline Density Management Study Area is located SW of Eugene, Oregon, and is the site of a multidisciplinary project examining how a wide array of variables are affected by varying varying degrees of stand thinning. Participating organizations include Oregon State University, USGS Biological Resources Division, USDI Bureau of Land Management, and the National Biological Information Infrastructure. This ArcIMS site provides access to a number of base layers and contains additional hyperlinked information for each density treatment type. Research data will be made available via this interface as they become available. The NACSE computing facility supports multiple platforms (Solaris, Linux, HP-UX, AIX, Win32, Mac OS X). Our GIS and database servers are powered primarily by Solaris and Linux (RHEL). We have the full ESRI ArcGIS suite installed on several Win32 workstations, and use Quantum GIS and JUMP GIS on our Linux desktop workstations. We also use GRASS and GMT on certain projects. We maintain non-spatial production databases in Oracle, Sybase, PostgreSQL, and MySQL, and spatial databases in PostgreSQL/PostGIS.